Floods are usually slow and predictable, but for some reason they are one of the most deadly disasters. Victims tend to be young, elderly, or operating a vehicle- but floods still pose a dire threat to anyone near one. The risen water level itself is not the only danger since the aftermath of a flood leaves damaged structures, mold, sewage, and displaced disease vectors such as rats. Besides flash floods and natural disaster related flooding, there is the possibility of long term water level changes due to global warming- whether cyclical or man-made. Hurricanes, severe storms, and heavy precipitation can all cause flash flooding, especially in basin areas. 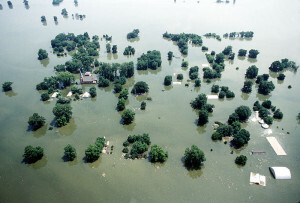 Flooding is a severe natural disaster that poses more danger as the water levels rise. This is mainly due to the lack of preparedness of those outside of 100 year flood plain maps. A flood map with levels denoted at the ‘100 year’ mark simple means that the current odds of a flood to that level in a given year is 1/100. There is no such thing as ‘overdue for a flood’, or predicting these floods over a long period since they are odds based and not by timeline. Yes. The one TEOTWAWKI event that could occur relating to flooding is if all of the ice caps melt rapidly. If it is slow and gradual, society may be able to adapt over long periods to the changing coastline. National Geographic has published maps of what the world would look like without icecaps, and it is surprisingly not too different looking. Florida would be gone, and most coastal cities would be underwater, but general land masses stay the same. In this event, flooding would be the least of our problems since the ice caps no longer present would have an immediate impact on the weather. Droughts, heat waves, and other disasters and global weather pattern shifts would likely decimate crops and water supplies around the world. The combination of all of these challenges would surely stress our society and create a very different experience than we live today. 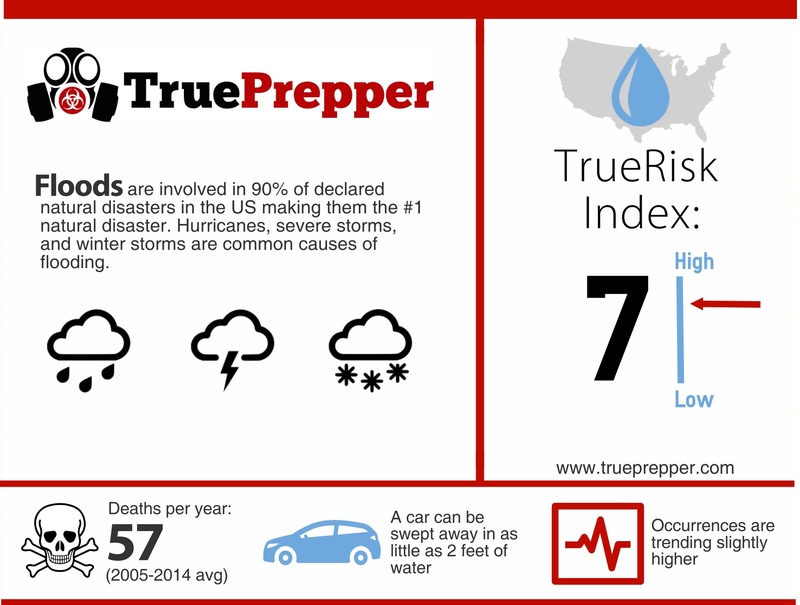 The TrueRisk index for Floods is a 7. This is extremely dependent on your geographic location, proximity to water sources, and the drainage characteristics of your land. FEMA has published maps in ArcGIS of 100 year flood plains that you can research on your home, work, and bug out location. If you live in one of these areas, you have likely been contacted by an insurance company since they monitor these maps closely. Regular homeowners insurance rarely covers flood damage, except where required by law. Taking a look at these maps to determine your risk is a great idea and starting point when prepping for floods. A flood is hard to combat, and is best served by preparing with a bug out plan. A bug out bag and alternate bug out location are both required. Often, advance notice will be given of federal and state mandated evacuations. It is important to heed these warnings, or you may end up being that family stuck on their roof with the TV chopper filming you. There are tools that make it possible to combat flooding. Sandbags to specially built inflatable walls can be used to keep your home out of the water, but both have their limitations. If the water rises too high, you are in the same predicament as everyone else at lower water levels. Bugging out and evacuating is the surefire choice, unless you are already surrounded by water. It is possible to become stranded in a vehicle during a flood, so a small car kit can go a long way too. Planning for a flood is simple. Determine your risk level with a flood plain map, and then determine if you should include preparing for floods in your bug out plan. Floods usually have plenty of notice, and sophisticated warning systems are in place using emergency radios, TV, and cell phones. Staying informed during a flood warning is one of the more important tasks you can do, in case evacuation is needed. You can also actively monitor your property and mitigate flood issues, like clogged drainage or diverting water flow as needed. Flooding can happen quicker than you may expect, so be flexible and aware of the situation. Flood waters can stagnate and stay at high levels well after the water initially rises. River basins are well known for this after regional storms or hurricanes. As the water subsides, it will leave behind damaged property, sewage, and even possibly remains. There have been several instances where extreme flooding has exhumed graves in cemeteries. Sanitation can be an issue after a flood, and post-flood areas are a festering ground for disease and sickness. When cleaning out anything flood damaged, it is a good idea to wear gloves and a respirator to avoid mold and disease exposure. Be sure to thoroughly check your home after a flood for any water damage or mold growth. If applicable, make sure you contact your insurance company as soon as possible to start the claim process. Regional disasters may make these claims take longer than usual.